It's been another amazing week for us over at Bah! Humbug! 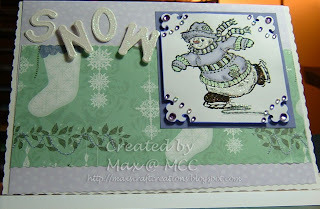 We've had such fun browsing your blogs admiring all the fabulous cards created for our Holly Challenge. Thanks to everyone who took the time and made the effort to join in. Today's the day we announce the winner of that fabulous Papermania Christmas paper pack and also set the theme for this week's challenge, which is ... SNOWMEN. 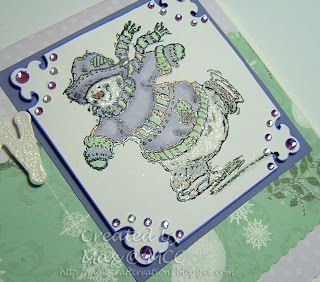 I used this cute Skating Snowman stamp from Serendipity and heat embossed the image with holographic embossing powder before colouring him with Promarkers. I still haven't quite got the hang of these yet but they do say practice makes perfect so I'll keep at it. I used a quickie glue pen to add extra holographic embossing powder to his face and body. If you click on the image you'll see the effect. Once set with the heat gun it gives a lovely sparkle and thankfully it stays put, unlike glitter. An X-Cut decorative corner punch was used before matting this cutie onto purple card and layering onto complementary patterned papers. Adhesive gems came to the rescue to 'bling' it up a bit and the glittery letters help to add some extra sparkle. I can't wait to see what beauties will be unveiled for this week's challenge and hope that you will find the time to play along with us and join in the fun. I am going to post a link at Fab's Big Christmas Card Challenge because it fits in with his 'Punch It and Bling It' theme, even though I'm more than a week late. Fortunately Fab is very forgiving. Your card is fabulous I love your little snowman, and those corners are fabby. Seven sleeps !!!!! Gorgeous Max - love that snowman. This is great Max. Lovely design and fab snowman. What an adorable little snowman Max! I'm having such fun with your Bah! Humbug! challenges. Hi Max, thanks very much for the lovely comments:-) I've had a wee look around, your cards are beautiful! Hope you're having a good week?